Begin by creating a separate space for clothing that needs to be hand-washed, bleached, dry-cleaned, or has stains that require special treatment. Put a small basket or bin on top of your washing machine or use a tote bag to store these items. This keeps them from getting mixed in with other clothes and makes them easy to find when you have the time to deal with it. Pick up at least two large baskets that are easy for you to carry from room to room. Use one to gather up dirty laundry from around the house and the other to carry your clean clothes. 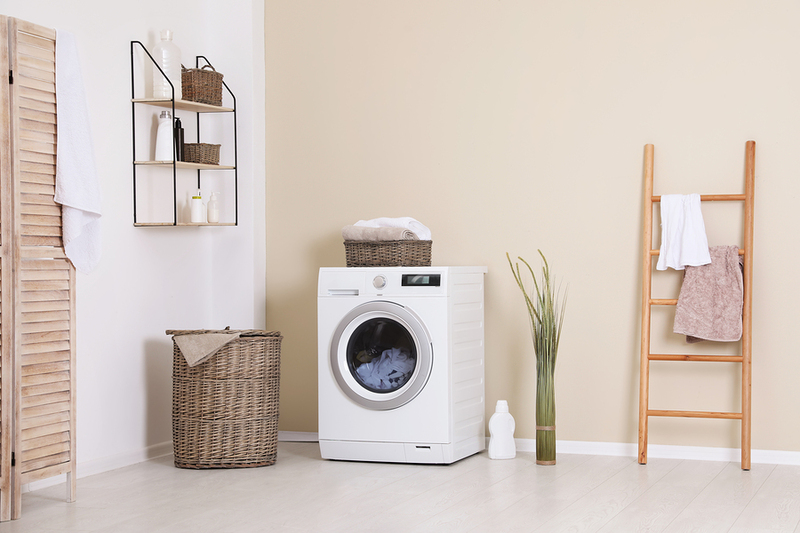 Enhance your laundry room’s aesthetic by choosing baskets that complement its color scheme and fit well in the space. Hanging shirts and other clothing as soon as they're done drying will reduce wrinkles, cut down on the amount of ironing you'll have to do later. Make this task easier by installing a hanging rod right above your washer and dryer and keeping hangers on-hand. Keep your laundry supplies organized by storing them in baskets by category. For example, all of your stain treatment items might go in one, while dryer sheets and balls go in the other. This is a great way to add a fun, decorative touch as well. It seems like every time we do laundry, we end up with at least a few miscellaneous items. Set aside a small basket or bin to serve as a receptacle for things like pocket change, Chapstick and socks that are missing their matches. This way, they won't get mixed up with your laundry and you'll always know where to find them.